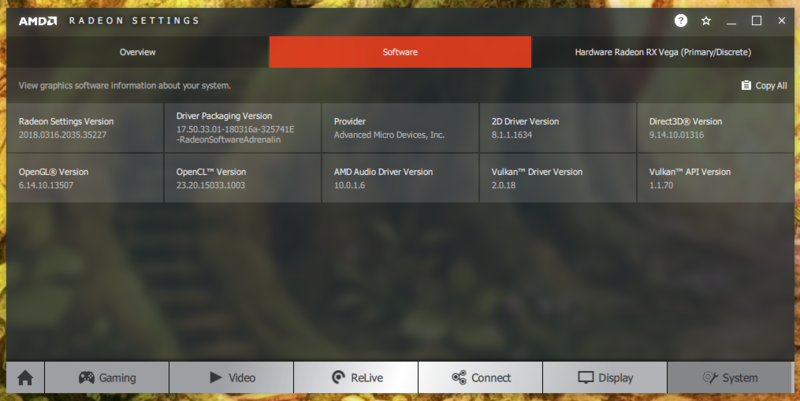 You can now download the AMD Radeon Software Crimson ReLive Edition 18.3.3 driver. This release focuses the launch of Sea of Thieves and A Way Out. This release also contains official support for Vulkan 1.1 and updates to stability with new end-user issue fixes. I am curious if they will EVER make the damn program remember the dimensions if you resize it. Apparently it's too difficult to implement. Still no RX Vega 8/11 support i guess? 17.50.27.02 -> 17.50.33.01 - Bit of a jump with these drivers then. AWayOut (A Way Out) - Added. A Way Out - Added. This reg key appears to have been deleted in 18.3.3 after comparing the INF files. HKLM, "Software\AMD\CN", AllowPartners, %REG_SZ%, "true"
A bunch of AMD 520's and 530's were added too. AMD6665.1 = "Radeon (TM) 520"
AMD6665.2 = "Radeon (TM) 520"
AMD6665.3 = "Radeon (TM) 520"
AMD6665.4 = "Radeon (TM) 520"
AMD6900.38 = "AMD Radeon(TM) 530"
AMD6900.39 = "AMD Radeon(TM) 530"
AMD6900.40 = "AMD Radeon(TM) 530"
AMD6900.41 = "AMD Radeon (TM) 530"
AMD6900.42 = "AMD Radeon(TM) 530"
AMD6900.44 = "AMD Radeon(TM) R8 M535DX"
AMD6900.45 = "AMD Radeon (TM) 530"
AMD6900.46 = "AMD Radeon (TM) 530"
AMD6900.47 = "AMD Radeon(TM) 530"
AMD6900.48 = "Radeon (TM) 530"
And for Topaz the settings of strange properties grows a bit. 11 new 530 GPU's, 11 new strings for this section. Wonder if that's what these are? So again probably not GPU related and the above is a coincidence. EDIT: But maybe they are? I don't know, 520 as the R503 and then the 530 as the Topaz on-die chip GPU maybe? Yeah they might be, there's a deleted Polaris 10 line. Let's say my hardware gets something in range of 2600-2700 points with variances between runs. I'm having a constant crash in altissia. The game has stability problems and various leakage of D3D11 resources and texture data, one of the most detailed and demanding areas of that game? Yeah I can see it accelerating the problem so it happens even faster. At long last they fix it. Gents, how is Eyefinity handled in this new driver GUI? Can I save monitor profiles (Both Eyefinity and Extended/Single monitor configs) like I used to be able to do in the older CCC? If it is that easy with cryengine then i assume it is similar in unreal engine and unity engine which are two very popular engines. Are you confusing the issue of "enabling Vulkan" in the editor, with the issue of rewriting a game to actually take advantage of the API. Unreal has supported Vulkan for years BTW. It seems good enough for my racing games, but then again I only installed the driver and can't speak for the rest of the package.